The Level 2 Certificate in Bookkeeping aims to provide learners in a comprehensive range of knowledge and practical skills they will be able to apply as a bookkeeper in a variety of job roles. The IAB Level 2 Certificate in Bookkeeping is aimed at individuals who wish to further their studies of book-keeping and gain a qualification at Level 2 of the regulated qualification framework. It could also be used by those candidates who have some practical knowledge and skills and wish to gain an accredited qualification in the subject. There is no formal qualification required for entry to the qualification at this level. It is, however, recommended that before commencing a course leading to the IAB Level 2 Certificate in Bookkeeping the prospective candidate will already have basic skills in numeracy and literacy and some understanding of basic book-keeping practices and terminology as covered in the IAB Level 1 Certificate in Bookkeeping or having some practical knowledge and skills at this level. The qualification is not graded. On successful completion of each of the mandatory unit, the candidate will be awarded a PASS in the unit completed. 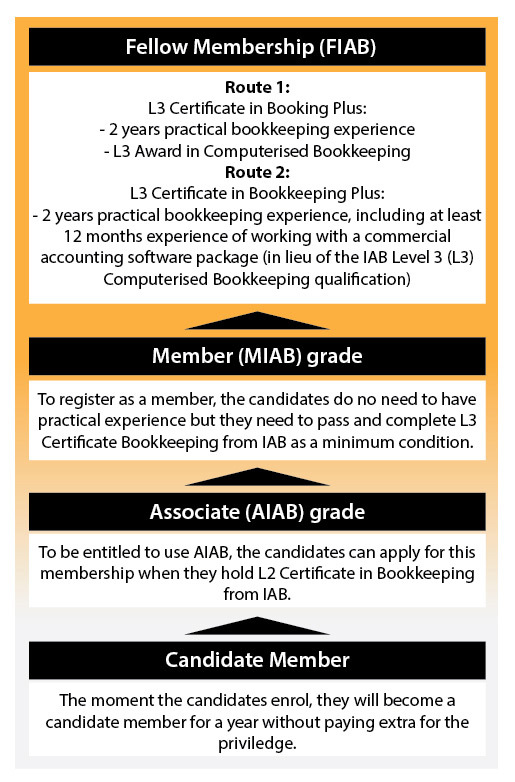 On successful completion of all mandatory units, the candidate will receive the Level 2 Certificate in Bookkeeping from International Association of Bookkeepers (IAB), UK.